UPDATE: Oops! It turns out the Wither got stuck in traffic and couldn’t make it to the first beta roll-out. But he’ll be in the beta (along with the Nether Star) on Friday! The adventurous among you will know there’s nothing quite like taking down a ferocious boss to prove your gaming might. Until now, that’s been a tricky thing for Pocket Edition/Windows 10 crafters to do. Thanks to update 0.16 that’s about to change. Soon Pocket Edition/Windows 10 players will have access to some of the most ferocious mobs we’ve ever devised. But we’re not stopping there - the update will also include ocean monuments and the trinkets to explore them, a bunch of new blocks, beacons, and Slash commands. We’re calling it The Boss Update because it includes bosses, is “boss” in nature, and is in charge of hiring and firing all the other updates released so far. So yes, the big baddies. First, there’s the Elder Guardian who has a penchant for hanging out in the new underwater ocean monuments with an army of minions while shooting lazers. Elder Guardians are a force to be reckoned with. 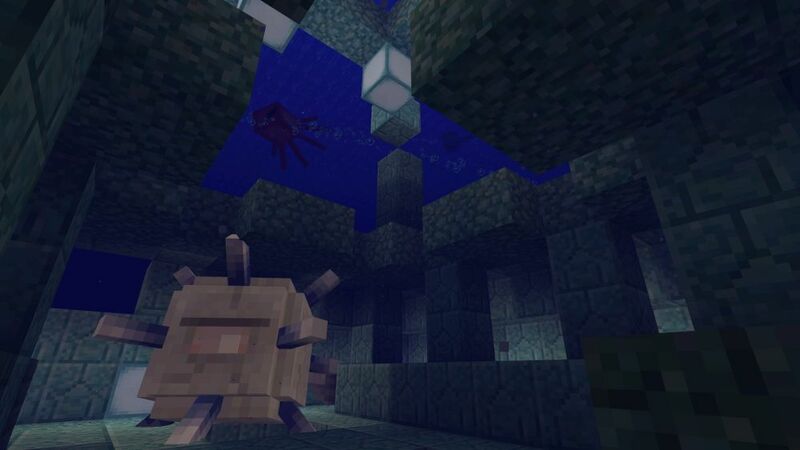 But this update also includes the Wither - a three-headed spookster that shoots blue skulls at your face. I’m a bit scared of the Wither to be honest. That said, I don’t recommend shying away from either of these mobs - defeat them and you’ll get rare loot including sponges and Nether Stars. Handy! In less creepy news we’re also bringing Slash commands to Pocket and Windows 10 Editions of Minecraft. They give you the chance to tweak the way the game plays - you can give items away, summon mobs, change the time of day, and lots more, all while playing the game. This update included 20 commands but we’ll be adding more in the future. The Boss Update will be available as a free update soon-ish for all Pocket Edition, Windows 10 Edition, and Gear VR Edition players but if you’re playing Minecraft on Android, you can help us test it out right now! Sign up to the beta, and give us feedback so we can make it even better! One note - players with active Realms won’t be able to access them while testing - you’ll need to revert back to 0.15.6 to re-enter your worlds. We’ll be sharing more information on The Boss Update at MINECON. Until then, happy crafting!